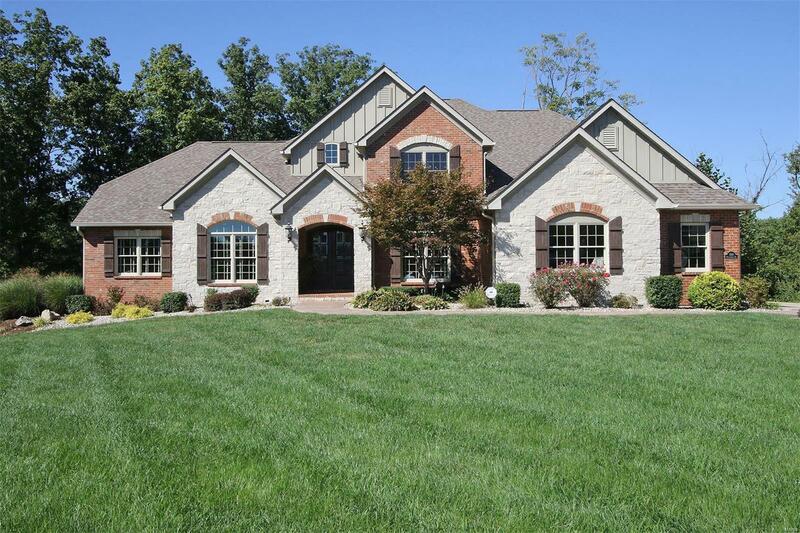 This elegant custom built home blends old world charm w/ modern conveniences. Authentic architecture, inviting entry foyer,beautiful hardwood floorrs, crown molding & chair rails, venetian plaster, wood blinds, casement windows, freshly painted custom décor. Two story sunken living rm with arched wood entry, fireplace & full wall of windows. Hearth-Family rm has stone, floor to ceiling fireplace flanked by custom cabinetry & beamed 16' ceiling. Gourmet kitchen w/ stainless appliances,spacious walk-in pantry. Nearby laundry and side entrance with built-in desk and cabinetry for the kids. Deluxe master suite has a sitting area with a view, coffered ceiling, and plush bathroom with marble fixtures and heated floors. Upstairs has a loft that overlooks the livingroom,3 bedrooms,2 baths. Walkout Lower Level is ready for guests w/ a complete theater, family rm, fireplace, wet bar/kitchenette with wood accents, copper ceiling. Outside enjoy the private pool, extensive patios, privacy & trees.